The auspicious month of shravan is soon going to begin in India. During this divine month the devotees of Lord shiva observe fast every monday and visit temples to offer prayers, milk and bilva leaves. Shravan month is observed all over the country and is considered as the best time to worship Lord Shiva. However in different regions this pious month starts on different dates. But the significance of this month remains the same in everypart of India. 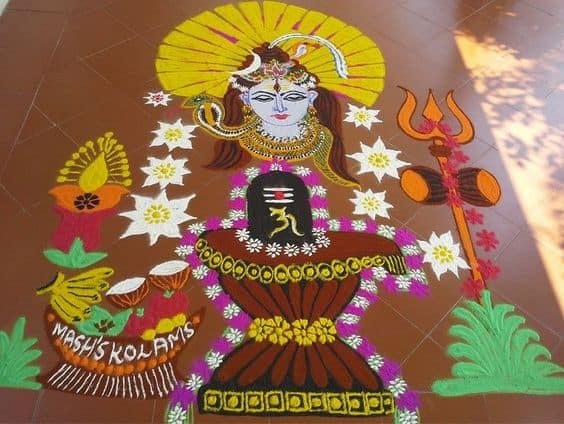 Today we are going to share with you some best Lord Shiva rangoli designs that will bring more postivity to your home, workplace etc. 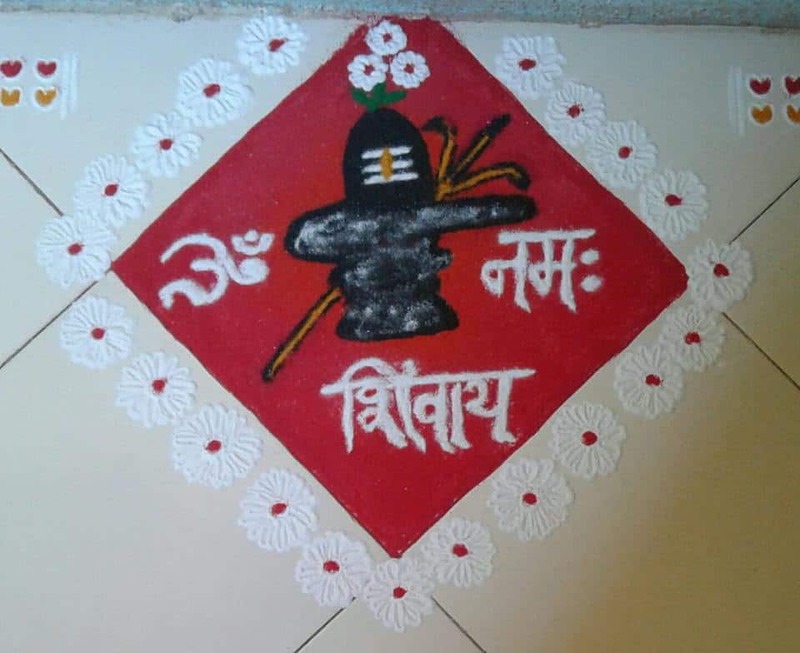 If you are searching for some amazing Shiva rangoli designs for your worship place, then you surely need to check this out. If your floor is of dark shade then make the Shivaling with white rangoli color powder for a better contrasting effect. 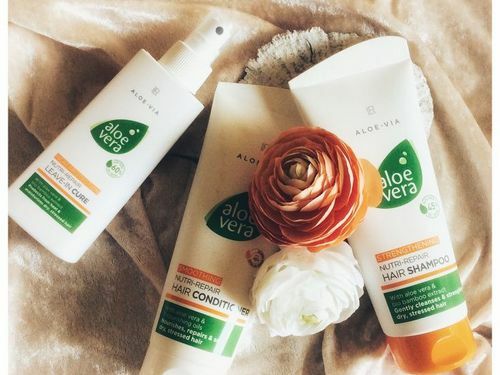 If you are thinking of trying something different and fresh then look at this creative design. 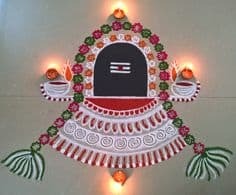 A Shivaling drawn on the base of a Sankh and on the inside part of the sankh a divine sketch of lord Ganesha adds to the charm of this rangoli design. Looking for a rangoli design where you can keep your viewers engaged for a couple of minutes then do have a glimpse of this masterpiece. It is a detailed rangoli design which depicts a pure picture of what Indian worship places are like. 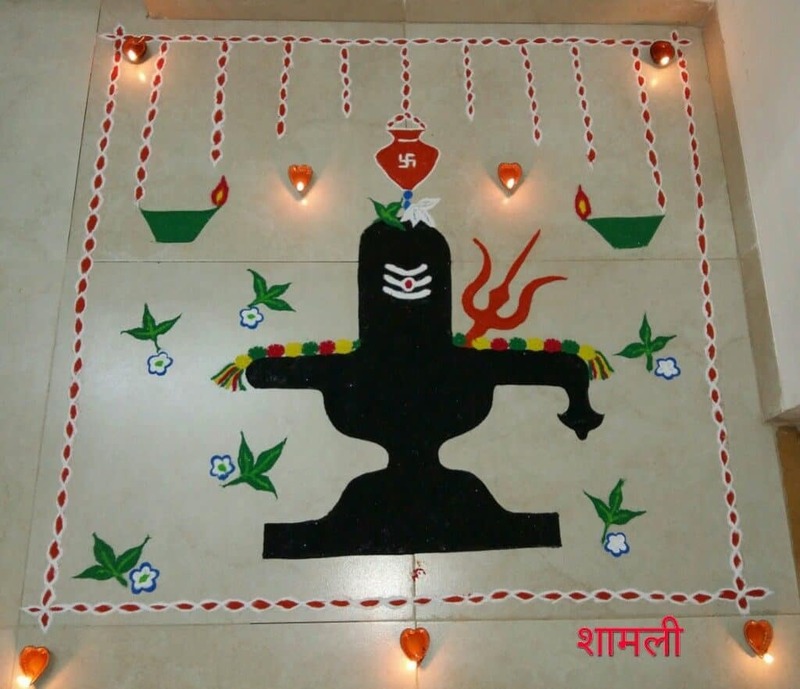 To make rangoli design you need to follow few simple steps. First of all make a fine sketch of Shivaling. Fill that sketch with black color and then place round small dots inside it with orange color, at an equal space. After you are done with the dots start from one point and make those curve lines with white powder encircling the dots. 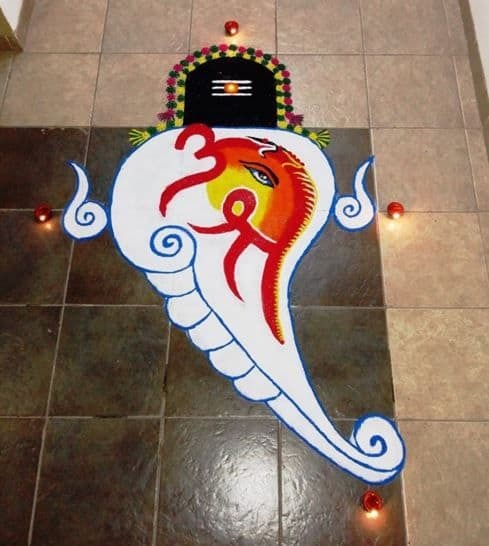 After completing this step outline the Shivling with orange color for a tidier look. 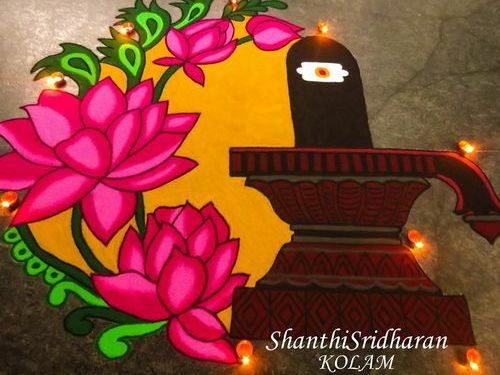 To make this spellbound rangoli design you need to master few rangoli making skills like shading techniques and also need to be good in drawing detailed sketches. 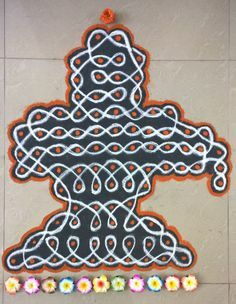 This is a simple rangoli design which can be easily drawn by rangoli beginners. You can decorate this rangoli design using diffrent floral motifs. Add more shine to it with earthen lamps. To decorate your shivaling design you can also use real flowers and kundan motifs. These substitutes are easiest way of adding beauty to your simple rangoli design. 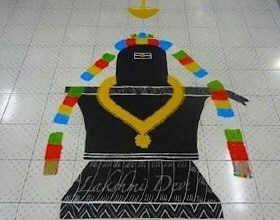 Drawn on the yellow background this shivling rangoli design looks so divine. The bells ringing on the top and branches of green leaf gives this design a totally dramatic look. 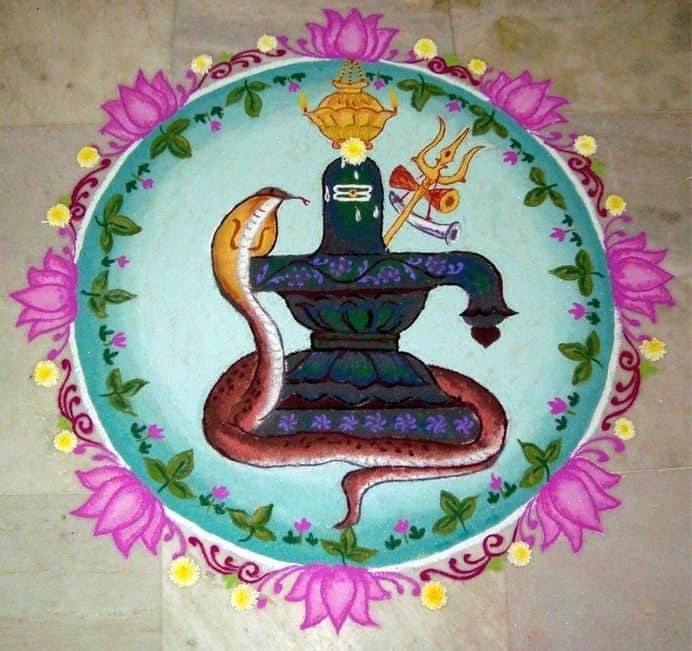 To make your rangoli design look more attractive you need to pick colors wisely. Any simple design can also look quite attractive if you look for colors that complement each other and colors that contrast each other. 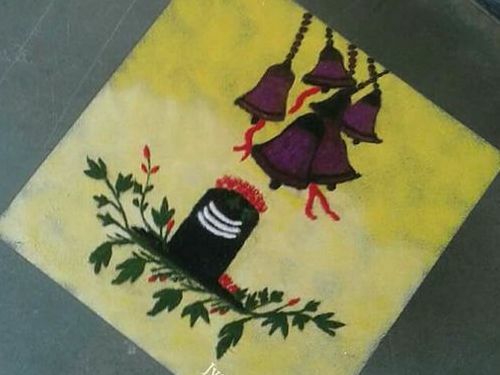 These are the best lord Shiva rangoli designs for this season. 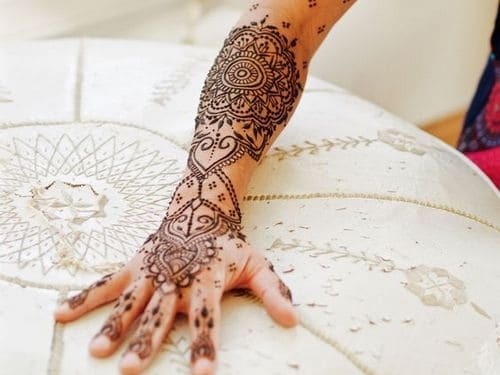 You can also share with us your rangoli designs and if they are amazing we will feature your designs in our upcoming posts.